Indirubin plays an important role in the treatment of many chronic diseases and exhibits strong anti-inflammatory activity. However, the molecular mode of action during mastitis prophylaxis remains poorly understood. In this study, a lipopolysaccharide (LPS)-induced mastitis mouse model showed that indirubin attenuated histopathological changes in the mammary gland, local tissue necrosis, and neutrophil infiltration. Moreover, indirubin significantly downregulated the production of interleukin (IL)-1β, IL-6, and tumor necrosis factor-α (TNF-α). We explored the mechanism whereby indirubin exerts protective effects against LPS-induced inflammation of mouse mammary epithelial cells (MMECs). 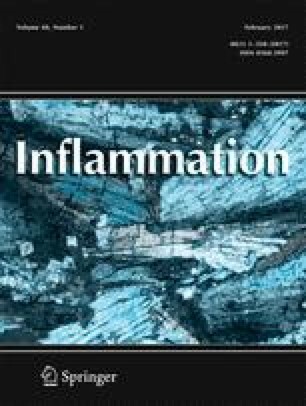 The addition of different concentrations of indirubin before exposure of cells to LPS for 1 h significantly attenuated inflammation and reduced the concentrations of the three inflammatory cytokines in a dose-dependent manner. Indirubin downregulated LPS-induced cyclooxygenase-2 (COX-2) and Toll-like receptor 4 (TLR4) expression, inhibited phosphorylation of the LPS-induced nuclear transcription factor-kappa B (NF-kB) P65 protein and its inhibitor IkBα of the NF-kB signaling pathway. Furthermore, indirubin suppressed phosphorylation of P38, extracellular signal-regulated kinase (ERK), and c-Jun NH2-terminal kinase (JNK) of the mitogen-activated protein kinase (MAPK) signal pathways. Thus, indirubin effectively suppressed LPS-induced inflammation via TLR4 abrogation mediated by the NF-kB and MAPK signaling pathways and may be useful for mastitis prophylaxis. The online version of this article (doi: 10.1007/s10753-016-0447-7) contains supplementary material, which is available to authorized users. This project was supported by the Special Fund for China Agriculture Research System (Beef/Yak Cattle) (grant no. CARS-38); the Natural Science Foundation of Hubei Province, China (grant no. 2015CFB435); the National Natural Science Foundation of China (grant no. 31101874); and the Fundamental Research Funds for the Central Universities (grant nos. 2662015PY054 and 2662016PY015).